There are two things that I want to write about today, namely my sandbox and the ruleset that I will use for running it. I don’t know if somebody besides myself will ever find this text useful, but I want to write it nevertheless, both as a kind of a statement, a promise to myself and a way to verbalize what is running around my head (and keeping me away from studying for my finals, exams etc.). First and foremost, my sandbox. For the last few years I have had a couple of attempts to running a sandbox, each one was an utter failure. Yesterday I made another map and this time I was really happy about it… but only for an hour or so. Later, I started to give it more thought and things stopped looking so pretty. I’ve got the impression that the scaling is wrong, the hexes are too large, the distances are too big etc. So, a lot of my effort goes to waste simply because I’m not good at creating maps. Hell, I never was. I hated geography at school, and I guess that now it shows. The map now lies before me and I’m really thinking about throwing it away, as I don’t think that I want to run a campaign in the world that I’ve drawn. I think that this can be a problem for anybody that is relatively new to the hobby (I started playing RPGs at the 30th birthday of D&D) and hasn’t been raised on sandboxes, real freedom of choice etc. But as always, the Internet has an answer. I can generate each and every hex of my sandbox (at least in theory), even during play. Then the world will be as surprising for me as for the players, and I won’t have to dedicate horrendous amounts of time to create a map that I won’t even like. I’ve found some ideas about how to determine the contents of every hex. Of course, that means that I’ll have to generate a batch of places before each game. But in reality I would have to do it either way, so it’s not a big deal. And as each place will be reusable (places will stay there, dungeons can be restock, each hex can host more than one lair), after each session of play I will have more stuff to get back to. For me it’s a win-win situation. Of course it can lead to funny situations, like a bunch of villages clumped together, some shrines and temples dedicated to different gods standing almost on top of each other, but it’s still the beauty of chance rolls. I like the idea and I want to create my sandbox that way. The second topic for today’s post is the ruleset I want to use. I love reading retro clones, I love the TSR D&D stuff, but there is a high probability that my players won’t like that. Almost everybody that I talked to is excited about playing in my sandbox (I will have it with me on various occasions and if another campaign isn’t available I’ll just run the baby of random), but they can and will get confused about some rules that are inherent for many old school games. So I decided that actually I won’t be making a retro clone of my own devise to use in my games, neither will I use something available. 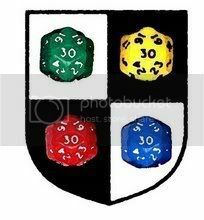 I do want to create my own set of rules and I do want it to be like D&D (the SRD enables me to do so, luckily). What will I do? I will mix the old with the new, make an eclectic choice (at least from the modern gamers perspective) of rules and hopefully will be able to brew something simple, fast and easy to run. Prime attributes and the bonus exp. Some form of bonuses and penalties for high and low scores, but I will cap it probably at +3. BAB. As hideous as it may be, I want to have it, as it’s easier than checking the tables to hit. But I’ll probably have the Monster HD vs AC table, because I like it. Three classes (Fighter, Magic-User and Cleric) and three races/classes (Dwarf, Elf, Halfling). I’m still uncertain about the Thief class. If I ever actually finish the booklet of my rules, it’s possible that I’ll add subclasses later on. S&W WB (or OD&D, I’m not sure yet) format of spells and monsters. It’s easy, not too detailed and I simply like it. Those are the things that I have come up with for now. This is all prone to change, and there is actually a possibility that I will post my materials here before I’ll compile a pdf. Oh, and what with possible generators? As You can see, they are basically system-free, and I like creating them, so if You visit this blog for that type of content, rest assured that from time to time I’ll post something new (or other type of system-free content, like description of a god or a place). That is, if I have the time and stop procrastinating. And if You like my monster ideas, as my game will still use this format of the stat-block, the stuff that I’ll make will have that pleasant, OSR style feel to it.